Since becoming a mom, I've had a lot of advice pushed on me. Some I wanted, some was helpful, some made me shoot daggers out of my eyes, and most was unsolicited. Everyone has their own views and are passionate about their own thoughts on raising babies. As a mom I feel myself wanting to burst with advice of my own. I think it's because as a mom you become sooooo absorbed in all the baby stuff. I even find myself giving advice to other moms who more than likely are probably just trying to vent. As a mom, I know not to be pushy. As a mom, I know different babies have different needs and no one thing works for everyone. I also know as a mom that sometimes advice IS helpful. Sometimes you need to try something different. So here is my unsolicited advice on all things baby. The First Two Months are Terrible: Seriously, if you are a new mom....it does get better. The first two months are not your new normal. I promise. It gets easier after the first two and when you hit 4 months you really find your new groove. Life is not over. You will sleep again. Clothes will fit again. You will be able to leave your house. Get out of the house: I can't tell you how many times people said this to me...."You are going to take that baby out today????" or "Poor baby, I can't believe his mommy took him out in this weather!" It's too hot, too cold, too windy, too rainy......whatever. There is not a perfect time to get them out, but for your own sanity it's important. They aren't going to instantly catch something. It's okay...get them out. It makes you feel normal. It makes you realize that you CAN do it. Have infant gas medicine on hand: Babies are gassy. For real. Get the gas medicine. It won't kill them. I fought my mom tooth and nail on this because I was too scared to give him too much medicine. I didn't want him/me to be dependent on it. He needed it though. Most nights when he woke up in the middle of the night...it was due to gas. Get it, love it, don't be afraid of it. 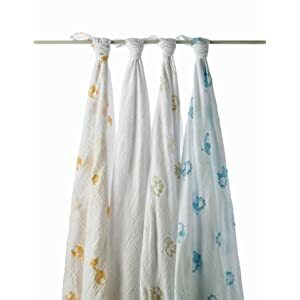 Return all your receiving blankets: They are the most favorite thing to buy on the baby registry. I had like 6 four packs and kept 4 of those. I wish I had only kept one. They work for the first month maybe, but then they are too small to swaddle. I like these much better....we still use them. They are big as a sheet, light weight, and so soft. Best things ever! Stop reading the baby books: Ok, you can read them, but take them lightly. They will make you think you are doing everything wrong. They do think everything will kill your baby. Ignore it. Use it to look up health problems or to get an idea, but don't rethink everything just because a book says something. Get your baby on a schedule: Okay, this one worked really well for us. It's not for everyone. In fact it's probably a sensitive topic for some. I read Babywise before Ethan was born and was so glad I did. It fit with my personality and it worked for him too thankfully. You don't have to start your baby on juice: I still don't understand why people (including doctors) push juice so much. My baby is just fine with water. He probably doesn't even need that right now, but we are practicing with the sippy cup before summer when he will really need it. I just don't think the extra sugar is needed. He will get his fruit via the food I give him. It's okay to do the hippy stuff: People gave me soooooo much crap for doing the cloth diapering and raise an eyebrow when I tell them I make my own baby food. It's okay though. People just think I'm taking things to extremes. I'm not. It's really not that time consuming, it's cheaper, and I enjoy it. With that said....it's okay if you don't do the hippy stuff too. Babies get hot: I'm not sure why everyone thinks babies are so cold natured. Mine just about sweats to death in the car seat or when he's wrapped up. In fact I have to be careful NOT to put a coat on him sometimes because he might overheat. Ignore all the old folks and do what makes your baby comfortable. Formula won't kill your baby: I'm all for breastfeeding. In fact we did it for the first 3-4 months. Then I dried up. In all honesty....breastfeeding drove me crazy. I could never produce enough. I felt tied to the pump. I felt like I could never get out, because is 2 hours I'd have to be back to feed/pump. I didn't know how much he was getting. I couldn't tell if he was full. With that said...I'll do it again with my next baby because I do think it is the best for baby. Formula is okay though. You aren't a failure. Even the breastfeeding moms will tell you that. Do what works for you: This is the most important advice I have. No matter what anyone says...you have to do what works for you and your baby. Everyone is different. Both you and baby need to be happy....do what you need to do to get there. There is no single solution or single way to raise a child. Keep a journal: You will be amazed at how much you forget from one month to the next. I've got mom friends with 1 and 2 year olds and when I ask for advice I'm amazed at how much they don't remember. But then I try to think back to where we were 2 months ago...and I draw a blank. Write it down...you'll need it for the next one. I hope this is helpful. I plan on looking back on it with the next one. Please feel free to add your own baby advice in the comment section. Amen sista! Ha ha yes you are right...put the baby books down. They'll drive you batty after awhile...and yes the first 2 months are horrible...not all fuzzy and warm like on TV or in the movies. I know people can't believe we use cloth diapers or make baby food. It's really not complicated! You are so right...get that baby out of the house and yes I'll do it without a jacket or socks b/c my baby is a little furnace! I am not a mommy, nor will I be anytime soon, but I just want to say that "unsolicited advice" happens all the time, and it's probably my biggest pet peeve. Put the baby books down? Heck yes. They drive me up the wall. When she was about 8 weeks old and sleep started regressing, I started browsing through a few of them. And basically came away thinking that I was a failure because she was SUPPOSED to be sleeping in longer stretches. Since then, I have tried my best to stay away from them and NOT let what "they" say dictate what I do as a mother. YES! Thank you for pointing out that you might as well return those stupid blankets. And the ungodly amounts of towels and wash-clothes that you receive. Great advice for new mommies! Excellent advice! The first two months are terrible. You sound like you got a lot of stuff figured it out already - good for you. They need to hand this out on a nice sturdy piece of hot orange paper when you leave the hospital. It would have made my life so much easier. I love the aden and anais swaddles - one of my most FAVORITE gifts now, along with sophie. We still use them too. I agree with every single thing you have on here. :) I'm actually going to post a link to this on my blog if that's ok with you? I know a few moms to be who could really benefit from this!!! Perfect post! Just what we all need to read- that we're not all crazy and that we can each do it our own way. Love it. My sons daycare is in the basement of a retirement home. I can't tell you the number of times the old bitty women have practically yelled at me because my son wasn't "properly dressed." Just because YOU are freezing all the time doesn't mean he is grandma. My son would sweat to death if I dressed him the way you want me to!And cloth diapers are the shiz. If it makes me a hippy, pass me the tye die and patchouli! It never ceases to amaze me how opinionated people are on the way I choose to catch my sons poo! This is a good post. I agree with most everything! I'm not quite a fan of the whole baby wise thing, but I know it does work for some, not all. I think all babes are different and can't all be programmed. Again, though, i'm so glad it worked for you! and getting out? I couldnt agree more. I was the girl at Kohls or some department store with a 2 week old baby. ALL THE TIME. Nursing in the car, or dressing room. Because I JUST NEEDED TO GET OUT. It was so helpful for my sanity. And now I feel like I can do anything with her. well said mama. well said. Thanks for the advice. I just came out of the closet with my pregnancy and love to hear what I should do. and i could not agree more with the receiving blankets! what a waste! :( maybe she'll use them as a blankie as a toddler...? the next time around, i won't buy/register for so many newborn onesies! emmalyn didn't wear a single plain white one. she only wrote four long-sleeved ones for when we went out, otherwise it was gowns all day in the house. We have gotten out and about as much as possible. Sometimes I feel guilty for how much we're out but it has been better for my sanity, confidence and getting back to pre-baby weight. Beach Bum sent me over. Great post. You hit the nail on the head. Thanks for sharing! You get a big AMEN from me on this one! I couldn't wait for my little one to turn 3 months old! I kept on hearing that after 3 months things were going to get a lot easier, and it's SO SO true! Amazing advice!!! I skipped the coat with my kids quite often for the same reason. My mom would always raise an eyebrow over it, but seriously? They get so hot!! My first advice I ever heard was to not ready the baby books. I stuck to it and I'm so glad I did! If I read all of that junk I'd be making myself crazy by comparing my kids to the "experts." Thanks for a great post! Your advice is dead on! Especially getting out of the house and the first 2 months. I didn't realize being in the house was driving me crazy until I followed my hubby's advice to get out and it made the biggest difference. 4 months and older is a whole different ballgame than those first 4 months - I always tell people I'd have 20 kids if they popped out 4 months old! I'm definitely going to share this link with other mommy friends! I love this! I wrote a very similar list. #1 is especially important to remember!